In a previous blog post, Entrepreneurial vs Consumer Mentalities, we spoke of the great need in the United States for the creation of new small businesses as an imperative part of a sustainable economy. The Stay Ready Studio in Houston, Texas is an excellent example. A few years ago Cynthia "ccain68", dissatisfied with the quality of products and service she was receiving from some local nail salons, decided to learn to do her own acrylic nails. Her experimental nail videos were a welcome addition to her already popular YouTube montage of hauls, friend tags, cosmetic reviews, weight loss tips, rants, rambles and "Look Good Fridays". Taking the popular concept of, "Stay ready so you don't have to get ready," and combining it with her her previously untapped talent for nail artistry, Cynthia opened the Stay Ready Studio at the end of 2014. On YouTube we followed her to manicurist school, cheering her on through the year as she completed 600 hours of class in preparation for the Texas Board of Cosmetology exams (under the Texas Department of Licensing and Regulation [TDLR]). In one video "The Truth Behind the Nail Industry" she gives us some insight into the experiences she had during the written and practical exams. In another video, "How to Prepare for Manicurist School" - Cynthia explains that to prepare for the state board exam, going to an accredited nail technician school is required in order learn proper sanitation methods, safety measures, nail anatomy, bacteriology, skin diseases & infections, legal issues and professional practices. To develop the artistic and creative side of the business however, it is absolutely necessary to do independent study and practice on one's own time. One must, for example, keep up with the current trends, learn to create a variety of nail shapes, apply glitter, adhesions, inlays, enamel designs, create 3-D acrylic sculptures and more. It takes hours of practice to perfect any application. One of the most requested nail shapes right now is the almond-shaped stiletto, which happens to be Cynthia's specialty. Properly shaping a square acrylic tip into a stiletto is one of the most difficult and time-consuming processes in nail design. Consider also that all ten nails need to match. Cynthia's drive and passion for her art propel her to continuously create new and unique designs for each and every customer. 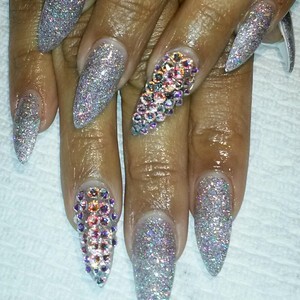 When in Houston do not miss your opportunity - get one-of-a-kind made-to-order nails by Cynthia! PetitPoix has received no payment or compensation of any kind from Stay Ready Studio.